One of my side interests is in graphics. And I'm curious about what makes an image famous. Particularly scientific images. So I'm going to try exploring that from time to time, focusing on my own field of interest, neurobiology. Over at the left is an image that I've seen reproduced many times. So often, in fact, that I'm having a hard time finding exactly the original source, to my embarrassment. It's from the work of René Descartes, 17th century French intellectual. I think it's from Treatise on Man, published around 1662 after Descartes' death. What the figure is showing is Descartes' conception of how behaviour worked. It looks fairly modern. Even if you understand only a bit of modern biology, you might think, "You have a sensory stimulus, impulses travel up the spinal cord to the brain, are processed, and you get a withdrawal from the painful stimulus." I think that's one reason why this particular diagram is famous: because it is almost eerily prescient. And indeed, in broad strokes, that's what this is showing. Descartes was the first to develop a reflexive theory of behaviour, although I don't think he used the term "reflex." Because Descartes is so famous for his ideas on the soul, his arguments that much of behaviour -- even in humans -- is purely "push pull" sorts of automatic, reflexive responses is often overlooked. That the picture looks quite modern in some ways actually sort of overshadows some important problems. Descartes had what I consider to be a pre-scientific concept of behaviour. The discovery of biological electricity was centuries away, so Descartes followed the ancients in thinking that behaviour was controlled through the movements of "animal spirits." Is the picture at top famous because of the idea that it shows? I don't think it's just that. Over to the left is another picture showing the same basic idea, again from Descartes, and I think even from the same book. 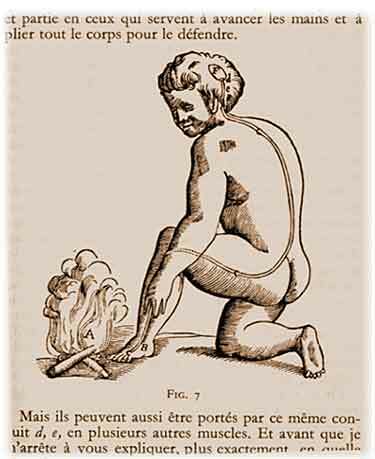 Regardless, you see the same basic elements: a fire, an outstretched limb, and "animal spirit vessels" leading to the brain. Yet this one I have not reproduced seen over and over again like the top one. I would say the top one is a classic, but the bottom one not. And here, the actual rendering of the diagram might be important in why this one isn't reproduced that often. I find the second one is kind of disturbing. The figure has sort of babyish proportions. The torso sort of floats out of a cloak, which no obvious indications of a bottom half. Plus, the "animal spirit vessels" don't go right out to the fingers, making the idea that there's a connection between the stimulus and the person's brain harder to understand. Or maybe the reason the top one is more famous is that editors are always looking for excuses to put in more nudes in their books.